One of the best things about being a parent is introducing your kids to the things you love. As I’ve mentioned before, my latest interest share with them is Doctor Who. The boys have gone from outright hostility towards watching it to grudging interest to (upon seeing their first episode) full blown Whovian. This, of course, has led to multiple proud geek dad moments, but this past weekend there were four. The first came as we walked through the mall. B and I had split up to cover more ground. While she went into one store to buy an item we needed more of, the boys and I browsed the menswear department to see if they had any burgundy suspenders. I decided to go on the hunt because I want to dress as the Eleventh Doctor for Halloween. Side Note: I actually like Tennant over Smith, but have to admit that Smith’s Doctor has a more iconic look – and one that is easier for me to replicate too. Besides, I have the Eleventh Doctor’s sonic screwdriver and I’d look silly dressing up as the Tenth Doctor with the Eleventh’s sonic! Anyway, as we looked through the suspenders (and as I suffered from sticker shock – I’m not paying nearly $20 for suspenders I’ll wear once or twice), JSL piped up with a request of his own. He had decided that he wanted to dress as the Doctor for Halloween also. I don’t think his plan of dressing as Doctor Nine is doable, but his desire to dress as a Doctor filled my heart with geeky glee. Next came a couple of nights ago. We were heading home from having dinner with B’s parents when B noticed that only part of the car had been rained on. Having just watched "Smith and Jones" – where it rains on a hospital and not the surrounding area just before the hospital is transported to the Moon, I thought a Doctor Who reference was in order. However, I didn’t say it. Instead, JSL beat me to the punch and exclaimed that we were going to the Moon. I was so impressed and proud that he not only remembered the episode enough to make the reference but also was quick enough to beat me. Then, yesterday, as we drove up to watch Disney’s Planes, NHL and JSL began to discuss Doctor Who. NHL decided that someone should build a Doctor Who theme park. He didn’t stop there, however, but began to imagine a TARDIS rollercoaster ride. I had to admit that I’d love to visit such a place. Finally, just after this happened, we were walking through a department store. As often happens, we walked by a row of mannequins. However, NHL didn’t see them as mannequins. Instead, he pointed out that they were Autons, clearly poising for an attack. Thankfully, many of the Autons-posing-as-mannequins were lacking arms, legs, and/or heads so they should be easy to beat when they inevitably come alive and try to take over the world. Ah the life of a geeky parent. Where others might see a normal menswear shop, rain, and mannequins, my kids see plastic-based aliens ready for attack, a H2O based teleport to the Moon, and a location to purchase bowties – because bowties are cool. 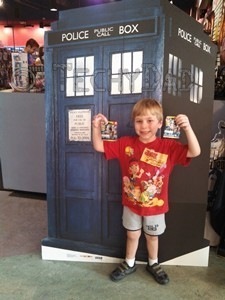 I’m so proud of my little Whovians and I can’t wait to see what new geeky interests we’ll share next.